Quack quack! Our virtual pet duckie has picked a winner. We have a special number of 444 total followers! 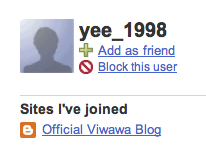 Out of 240 Blog and 204 Twitter followers, duckie has picked yee_1998 as our free 100 Viwawa cash winner for this week! Hi yee_1998. To receive the 100 Viwawa cash, please use the winning account to comment here with your Viwawa username. u mean tell my viwawa account name here? We need to confirm that your blogger account and your Viwawa user account both belong to you. the viwawa acc i playing is use my bro email, last time i saw the viwawa thing so i just followed to try my luck and i using my blogger acc which i anyhow create and forget about it so like that how?i myself never create acc in viwawa. 1. Give it to your brother's account, or anyone else's for that matter. 2. Create a Viwawa account for yourself so you can enjoy the free 100 Viwawa cash. oh so easy, em i want give to monster65 my another bro account can? Done! Thanks for supporting Viwawa!